When it comes to measuring your marketing, analytics are everything. They’re how you improve performance, optimize your spending, and create better customer experiences. Fortunately, marketers now have access to more audience and performance data than ever before. To be useful, though, that data should be correctly consolidated, processed, and interpreted. 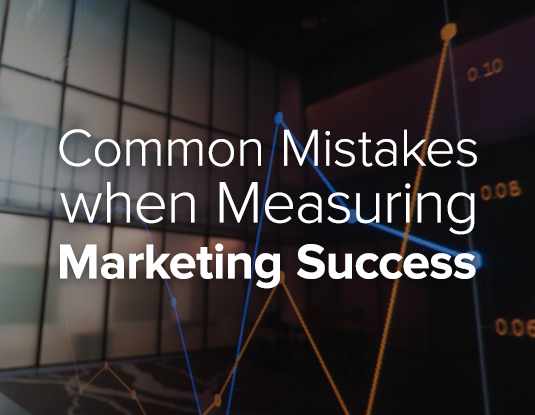 To help you accomplish that, here are four common marketing measurement mistakes and what you can do to avoid them. Before you launch a campaign, it’s essential you define what will make it a success. That might be increased sales, more media efficiency, or greater customer engagement. Once you’ve defined success, you must identify the right KPIs so you can measure and quantify that success. Having clearly defined goals and corresponding KPIs enables your marketing to accomplish whatever is most important to your business. Benchmarks are a key component of establishing KPIs. Whether they’re derived from your data, competitor data, or vendor data, benchmarks must be put into context. For instance, organizations commonly set benchmarks by analyzing internal historical data without accounting for factors such as promotions, media blitzes, seasonality, and competitor activities. To ensure accurate results, all those variables must be considered when determining benchmarks. Too often, marketers conclude that correlation explains how their marketing drives leads, conversions, and sales. However, correlation isn’t the same as causation. A tech company, for example, may see an uptick in product sales and attribute it to new marketing campaign without considering influential external factors. Marketers should apply critical thinking and comprehensive measurement at every touchpoint along the customer journey to conversion. Doing this will account for those subtle, yet important, distinctions between correlation and causation. Multi-touch attribution has long been viewed as a direct response exercise tying digital efforts to leads, conversions, and other direct response metrics. Today’s sophisticated media and marketing attribution provides a much more holistic view of performance. It incorporates multiple brand engagement activities into a single KPI metric to streamline measurement and optimization by each audience segment. This helps marketers optimize budgets, coordinate customer experiences, and increase marketing accountability. Based on Five Common Pitfalls and Best-Practices of Measuring Marketing and Advertising Performance by Manu Mathew.